Two games in charge for Kenny Dalglish and he has yet to see Liverpool win a game. After getting knocked out of the FA Cup by Man United at the weekend, Liverpool were soundly beaten by Blackpool 2-1. If Blackpool stays up this season, is their any doubt that Ian Holloway deserves the Manager of the Year award? Liverpool got off to a dream start when it seemed that Dalglish had weaved some of that instant Kenny magic. Fernando Torres, took a good ball from Martin Kelly and smashed a shot into the roof of the net. It was only Torres’s second goal away from Anfield this season, which is a major reason why Liverpool have struggled so much. But Blackpool were undaunted about playing Liverpool and within 10 minutes they were level. A mistake by Merieles in midfield allowed Blackpool to break and lTaylor-Fletcher slotted the ball past Pepe Reina. 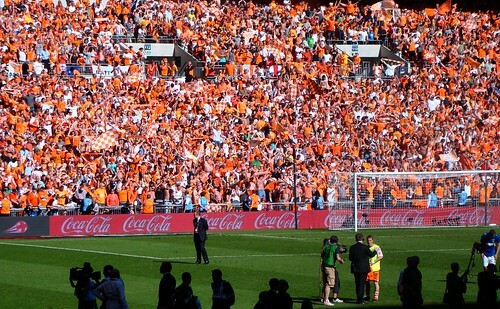 From then it seemed to be a matter of when Blackpool would score again. DJ Campbell and Taylor-Fletcher both missed great opportunities to put Blackpool ahead but somehow Liverpool survived and went into half-time tied at one. In the second half DJ Campbell finally got the goal that Blackpool’s play deserved as he was unmarked to head in from six yards out. If you did not know anything about the two teams tonight and just watched the game, you would have seen one team full of confidence, great football and always going forward. That would be Blackpool. They look like a Premier League side and with 28 points already they are only four wins away from ensuring their Premier League survival for another year. From watching Liverpool, they looked liked a team lacking in confidence and quality. They have not bought well in the transfer market for three or four years and it is starting to show. Liverpool, have 25 points this season, only 4 points above the relegation zone. On tonight’s performance, Liverpool looked like a bottom half of the table team that might finish the season just above the relegation zone. But that is not guaranteed. As Roy Hodgson found out, this is not the Liverpool of old and Kenny Dalglish has a major rebuilding job on his hands if Liverpool are to get back to anywhere near challenging for a European spot.